Looking after your optical health means a great deal more than just testing your eyes. 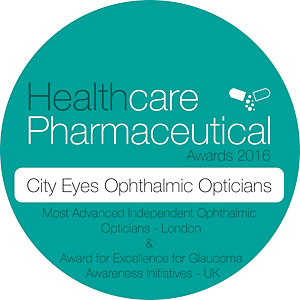 That’s why when you go to the City Eyes Ophthalmic Opticians’ consulting rooms in Moorgate, you’ll experience a level of healthcare that goes way beyond an eye test. You’ll get an 18 point process designed to cover every facet of your optical wellness. Discover the 18 reasons why you should have your eyes looked after by City Eyes Ophthalmic Opticians. We’ll take time to outline the full history of your symptoms or any problems you may have experienced with your eyes and we’ll ask you about your family’s optical health history too. Finally, you can tell us about your general health, your lifestyle and what your hobbies and interests are. All of this will give us a clear picture of what your eyes are going through every day, and if there are any potentially inherited eye conditions that we can take preventative action against. We’ll carry out a detailed examination of the external areas of your eyes to ensure each of your corneas, (the transparent part at the front of your eye), are completely healthy and have no scratches or abrasions, which could weaken the tissue, making it easy for bacteria or viruses to penetrate. This means you’ll dramatically reduce the possibility of eye infections that could be potentially sight threatening. Your long-term, optical health depends partly on your eyes working together as a team. We’ll thoroughly check the movement of your eyes, so you can be sure they’re working in perfect harmony to prevent squinting and lazy eye, headaches and blurred or even double vision. A crucial part of your Optical Health Analysis will be for us to test your pupil reflexes to check for possible damage to the nerves that serve your eyes. This is a straightforward examination using a traditional pen torch slit lamp, but it will help to identify any underlying general health problems. We’ll carry out a colour vision assessment, using specially designed colour vision plates, to test for any signs of colour deficiency in your eyes. This is most common in men and can indicate a more systemic health condition such as diabetes. Your colour vision assessment will identify possible problems and help you by enabling you to take a “preventative” approach. Your eyes need to be able to accommodate and converge without being strained, and we’ll test this ability for you using an RAF rule. Now don’t worry, we won’t expect you to pass a pilot’s test, but we will establish the strength of your eye muscles to ensure your eyes function in a coordinated manner, which means you’ll be able to maintain comfortable binocular vision by being able to focus and refocus from near objects to far objects and vice versa, without any discomfort or double vision. We’ll thoroughly test your eyes for “Near Vision” capability using the Snellen near point chart, which will give an accurate measure of your eyes ability to read particular objects at a given reading or working distance. If you regularly use computers and VDU’s, we’ll carry out some key tests using the unique Prio-Vision Tester. This amazing equipment will simulate a computer screen at an appropriate working distance and its illumination is designed to determine and quantify the exact stress that your eyes are under when you are using a computer or VDU screen. These key measurements will then be used to prepare a bespoke, completely individual set of lenses, which will be put into your chosen frames solely for you to use when working on computers. We’ll thoroughly test your eyes for distance vision, again using a Snellen vision chart. This test will ensure you are able to perform normal day-to-day tasks such as driving, reading, leisure activities etc. We’ll take a close look at the internal structure of your eyes using a hand held Ophthalmoscope, a simple piece of equipment but one that is very important to your Optical Health Analysis. The Ophthalmoscope will enable us to check for cataracts or any other eye or general health problems by examining the crystalline lens inside your eye to check for discolouration or cloudiness that could prevent light from being focused through it, so images will not be transmitted to the light sensitive part at the back of your eye – your retina. Your visual fields will be thoroughly checked for peripheral vision problems and blind spots using the Henson visual field analyser. Peripheral vision problems and blind spots may indicate more serious health condition like glaucoma, diabetes, retinal damage due to disease, injury or inherited conditions such as Night Blindness. Glaucoma is a disease that is easily treated but if missed, it can cause blindness. To make certain you’re not at risk from Glaucoma, we’ll carry out a simple procedure to test the pressure inside your eyes. This is the easiest, and most hygienic way to check for Glaucoma, and take preventative action if required. We’ll use a darkened atmosphere and some specialist equipment to check for the possibility of night blindness, so you can be sure you’ll always be safe on that late night drive home from a business meeting. We’ll take some retinal photographs of the back of your eyes using a specialised digital camera that will map out and permanently record up to 45 degrees of the light sensitive part of your eye (retina) taking in the most important parts which are the optic nerve and the focal point area (macular) where all images are focused before being transmitted to your brain via your optic nerve. If you have a history of Diabetes, Glaucoma or Retinal Detachment, we’ll dilate your pupils for a detailed internal eye examination that enables detailed observations to be taken from the back of your eyes using a slit lamp, ophthalmoscope or retinal camera. Your blood pressure will be carefully tested using a digital BP tester, which is fast, accurate and comfortable to use. Why is it important to do a blood pressure test? Simply because when there is a high blood pressure problem that is not detected, or is out of control, this affects the blood vessels at the back of the eyes in addition to the rest of the body. This can lead to a condition called Ocular Hypertension which can cause the blood vessels in the eyes to rupture and burst causing bleeding (haemorrhages) behind the eyes and disruption or loss of vision. Once completed, we’ll discuss your results in detail with you, explaining exactly what the results indicate and any implications that may need to be addressed. Then if appropriate, we’ll talk through the potential solutions and help you to make the right decisions for you. At this point, if there is a medical condition that needs further examination or treatment, we’ll professionally refer you to your own GP, or to a hospital consultant. Finally, and if required, we’ll show you a range of designer and standard frames for spectacles, together with a range of easy to use, fashionable contact lenses to help you find exactly the right look for the image you want. We have the right products for each and every need or occasion. This encompasses spectacles or contact lenses for sports use, computers, occasional use and safety eyewear. Contact us to book an eye examination today.